When is Earth Hour 2011? Earth Hour will be held on Saturday March 26 between 8.30pm and 9.30pm in your local time zone, which is this weekend as I write this post. Those of you who have been reading this blog regularly, and perhaps follow environmental news and events, will no doubt already know the information in this post, so you need not read any further. 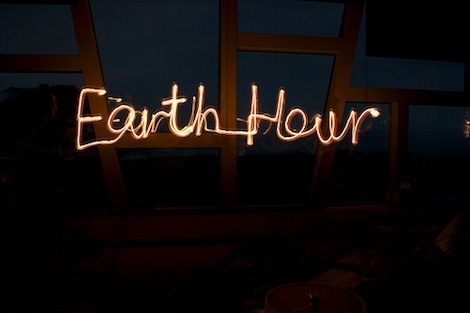 If you don’t already know what it’s all about, here’s the lowdown on Earth Hour 2011. Earth Hour is a fun, annual and global event. For Earth Hour 2011, individuals, businesses and governments around the world are encouraged to take positive actions for the environment, and to celebrate their commitment to the planet by switching off their lights for one designated hour. The event began in one city, Sydney Australia, in 2007. During that first event, more than two million people and two thousand businesses turned off their lights for one hour to show their desire for action on climate change. It was a great show of collective support from one city at the time. In just the few years since 2007, Earth Hour has grown to become a massive and collective global event. What’s the point of Earth Hour 2011? As I understand it, in 2011 Earth Hour is aiming to show the actions that people, businesses and governments worldwide are taking to reduce their environmental impact. As part of this, the act of turning off lights for Earth Hour is not so much about saving power (it never has been), but an act of global solidarity at a time when it is much needed. Earth Hour 2011 will see many of the world’s iconic buildings and landmarks again switch lights off for the hour. Earth Hour is also hoping that hundreds of millions of people will again participate by switching off their lights to collectively celebrate a commitment to protecting the environment. Earth Hour is more of fun celebration, a party, than it is a protest. No, of course the act of even hundreds of millions of people turning lights out for an hour is not in itself enough to have a positive impact on the environment. That’s why this year Earth Hour is asking people to commit to actions that go beyond the hour. Additionally, Earth Hour has become a platform for individuals, businesses, organizations and even governments to show the world what actions they are taking to reduce environmental impact, and how they are attempting to move toward a more sustainable way of living and working. For many people Earth Hour is still about taking a first step, by acknowledging and celebrating the desire to change by turning off lights for one hour. As many of us now know, there is a long way to go, and a lot of people need to go down that road together, as quickly as possible.